They take a little time to cook, but for a relatively inexpensive cut of meat, they're remarkably tender and delicious! And if they came from a lamb that was free to graze, they'll have less saturated fat and more omega-3 than just about any cut of grain-fed beef. 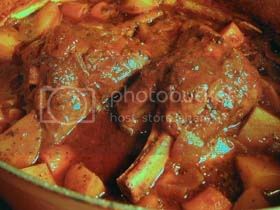 The lengthy braising time removes any gamey flavor that causes some people to shy away from lamb. So if you're looking for a warm, meaty dish on a cold night, try this. Note: The recipe may be doubled (4 shanks, one per person) but you'll need to plan on a larger Dutch oven, at least 7 quarts. You could also use a roasting pan, just make sure to cover it tightly as the shanks cook. The seasonings may be adjusted to your taste. The amount of liquid may also be adjusted, as long as the shanks are almost fully submersed when you place them in the oven. 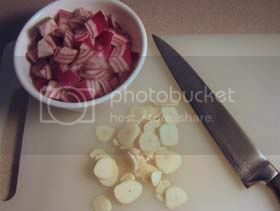 2 Prepare onion and garlic. Rinse shanks with cool water. Pat dry. Sprinkle with black pepper and a dash of kosher salt. 3 Preheat a medium-sized Dutch oven (4 to 5 qt.) on medium high for 1 minute. Add 1 tbsp. oil and brown shanks on high, 2 minutes per side. 4 Transfer shanks to a plate. Reduce heat to medium. Add the other tbsp. oil to the pan, and sauté onion and garlic until they just start to brown, about 5 minutes. Turn heat off. 5 Stir in all of the spices except the bay leaves (from oregano to black pepper), and let bloom in the warm oil for about three minutes. Turn the heat back up to medium-high, stir the flour into the vegetables. Add one cup of red wine and allow to boil for a minute while stirring. Add the beef broth, tomato sauce, molasses, tamari, and bay leaves. Bring to a boil and add the lamb shanks. Cover the pan and place in a 350°F oven for 15 minutes. Reduce the temperature to 300°F and cook for another 1.5 hours. 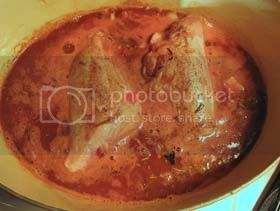 Check every half hour and add more wine or broth if the sauce becomes too thick or dry. Note: Liquid should come about three-quarters of the way up the sides of the meat before placing in oven (as shown). You don't want all the liquid to evaporate as the shanks cook or you'll end up with dry meat and a scorched pan. The amount of evaporation will depend on how tight-fitting your lid is. 6 Add the carrots and potatoes and cook for another hour, checking the consistency of the sauce periodically. 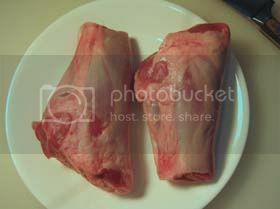 7 If you'd like to remove some of the fat rendered as the meat cooked, transfer the shanks and vegetables to a plate. Strain the remaining liquid through a sieve into a gravy separator. Pour the defatted sauce back into the Dutch oven or roasting pan. Thin with additional wine/broth/tomato sauce if desired. Bring to a simmer. Add back the shanks and vegetables to reheat before serving. This is my first attempt at Braising meats! It was great, easy and fun. Thanks. Pat, that was nice of you to say, Thank you! You've made me wish winter was just around the corner. David, I must have missed your comment first time around. A belated thank you to you too! Should I double the ingredients if I use 4 shanks? Yummmm,also seems like a great diabetic friendly meal. made it with three lamb shanks... and a little extra everything else. i also added paprika, and a bit of cinnamon and nutmeg - just a personal taste thing. everyone raved and raved. wonderful recipe. i will make it again for sure.